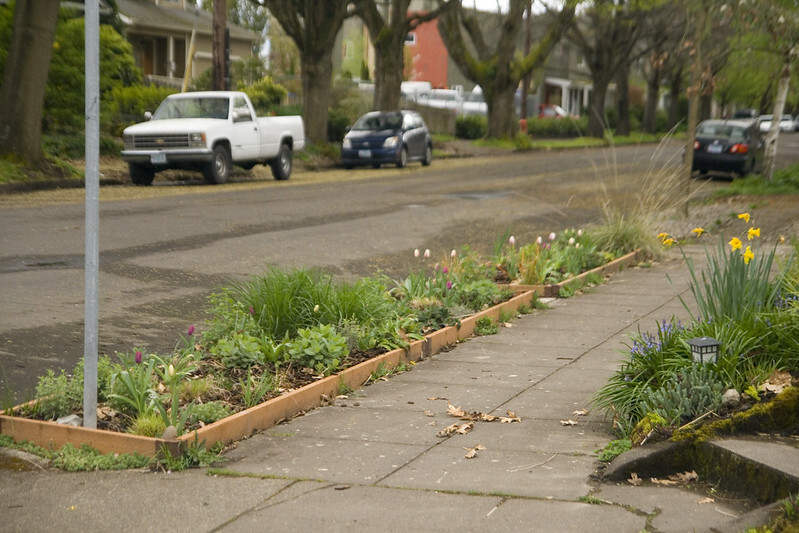 Here we are at last, the final chapter in my series about my Parking Strips first year, taking us form Autumn into Spring again. 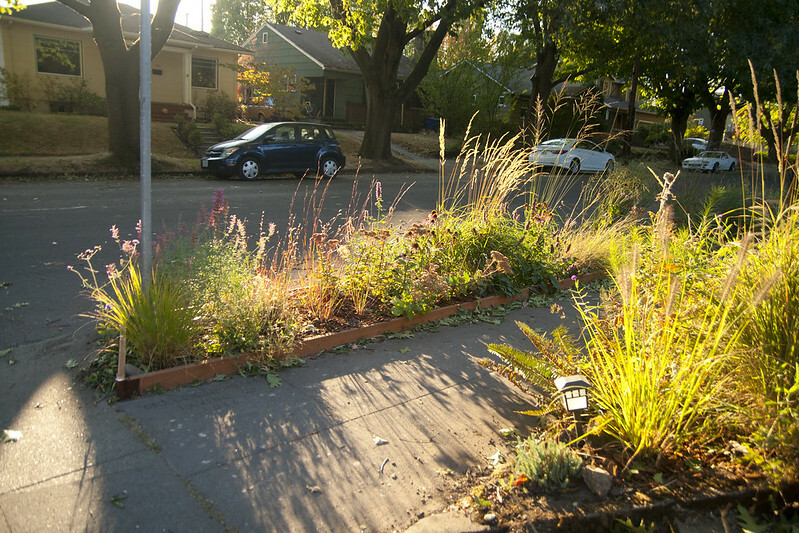 In spite of a prolonged dry season last year, I'm happy to say the parking strip held up amazingly well. 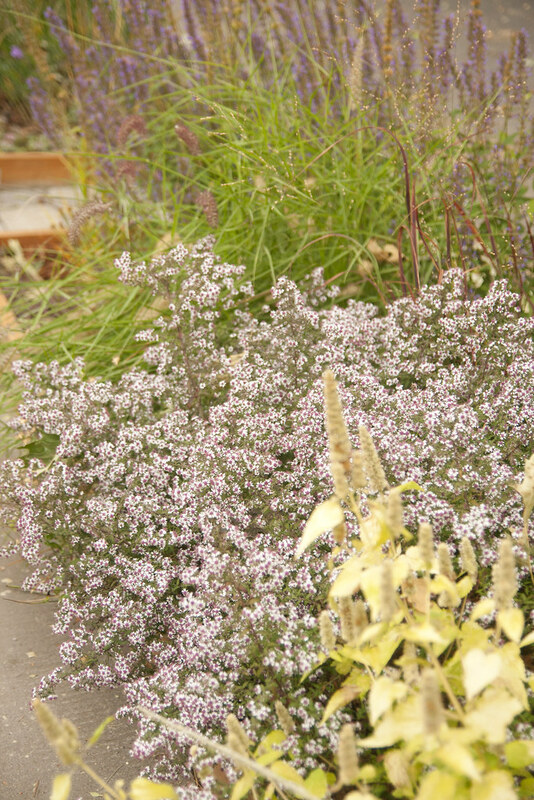 While Aster 'Prince' has wonderful, dark foliage through spring and summer, in autumn, it is bedecked by millions of tiny blooms as well. 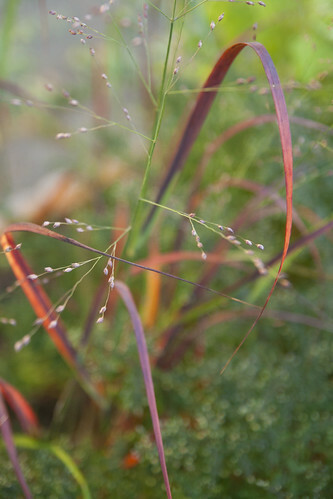 Of course, Autumn is the season where grasses all get to strut their stuff...like the above Schizachyrium 'Blue Heaven'. 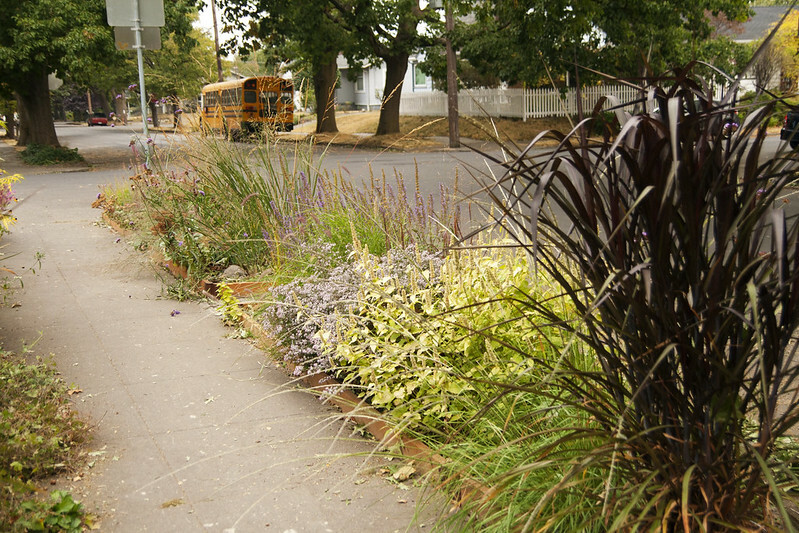 On the left, we have the wonderfully architectural, arching bloom stalks of Muhlenbergia rigens. 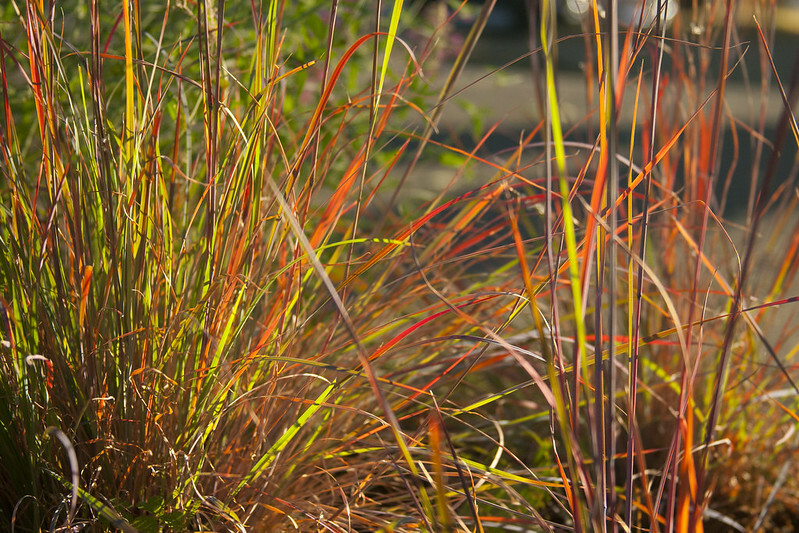 On the right, the richly-colored Panicum 'Huron Solstice'. Autumn in Portland, as in most places, is divine! Some time in late September, I actually changed a few things in the Parking Strips...yes, I know, not even a year has passed since planting them, and I'm already editing. 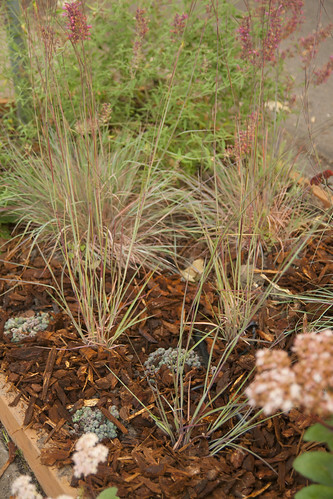 I decided to add a few more Schizachyrium 'Blue Heaven' to the strip...creating a much fuller planting. I also replaced the poor Geum triflorum, which croaked, with the elegant Molinia 'Cordoba'. 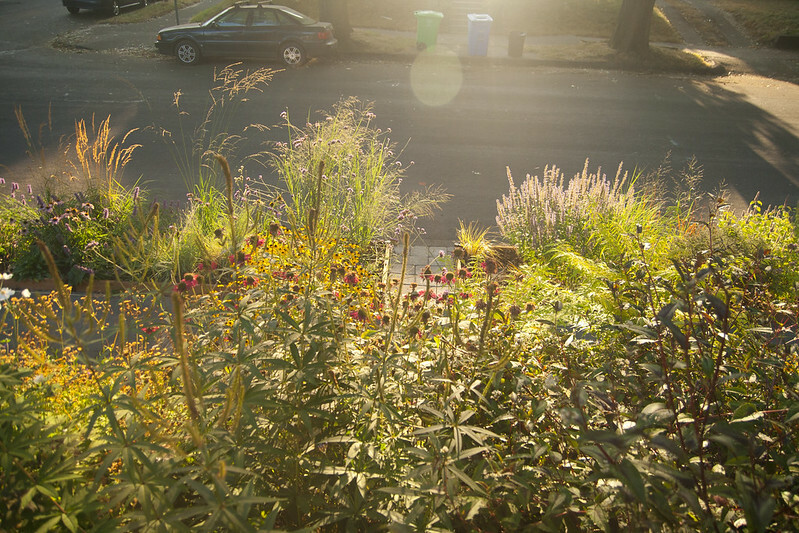 The light during autumn is so wonderfully mellow, especially at sunrise and sunset. 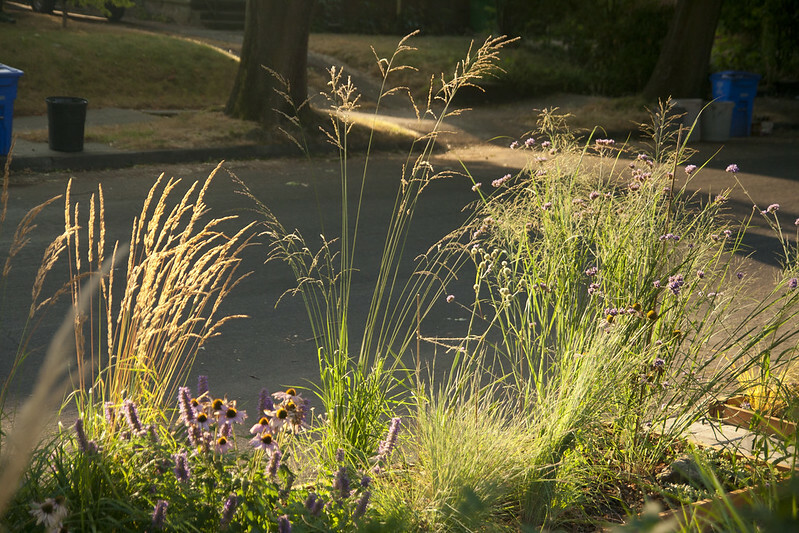 Grasses truly are in their full glory when backlit. 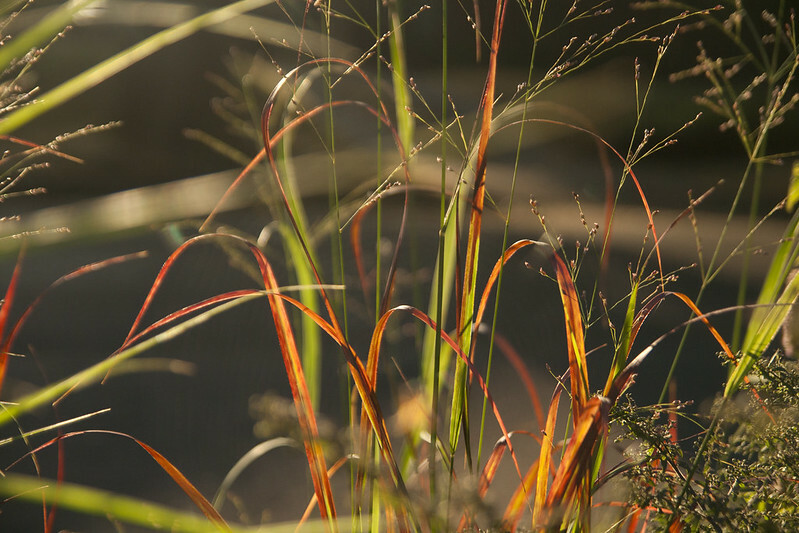 The arching blades of Panicum 'Huron Solstice' seem to lick at the air like flames. It's times like these that I just want to stop time and revel in the perfection of it all. Never, ever, underestimate the power of light...these moments may be fleeting, but they are undeniably powerful, especially in the cooling days of autumn. 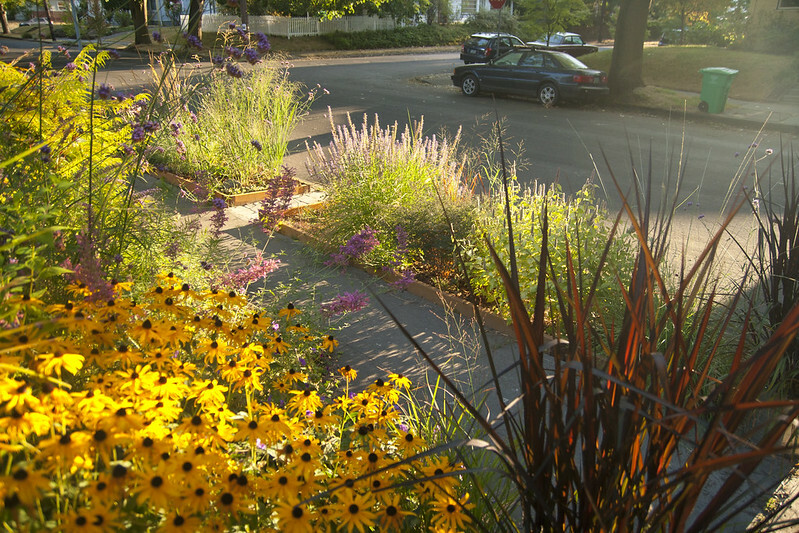 By Labor Day last year, the parking strips were so full, it was hard to believe that they had just been planted that spring. 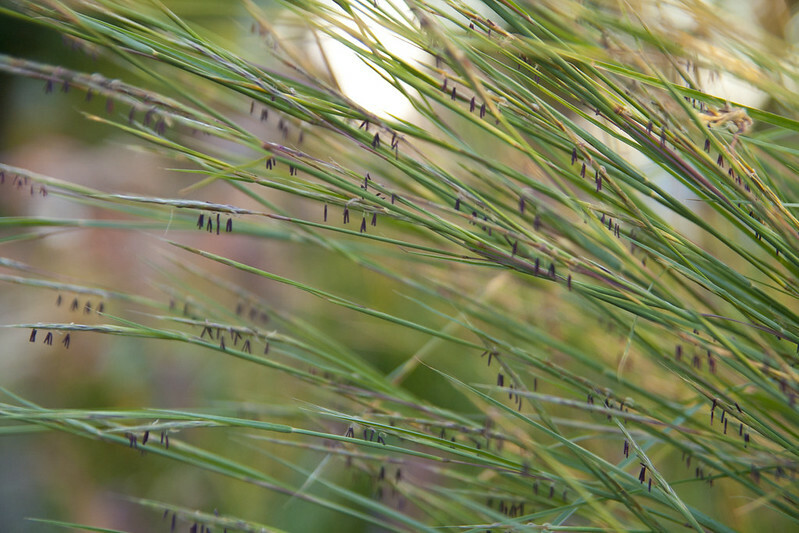 While some plants in the garden tend to become a bit sprawly, you can always depend on ornamental grasses, like Muhlenbergia rigens above, to lend grace and structure. 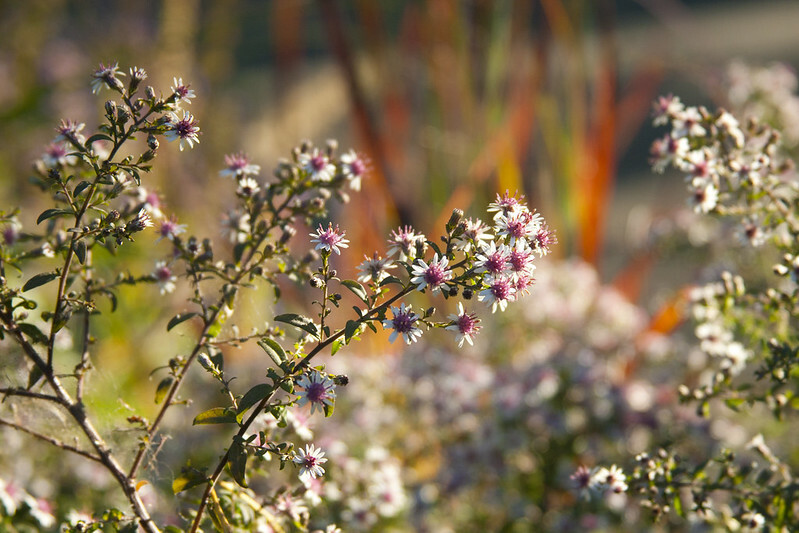 October finds Aster 'Prince' a veritable cloud of tiny white, red-eyed blooms. 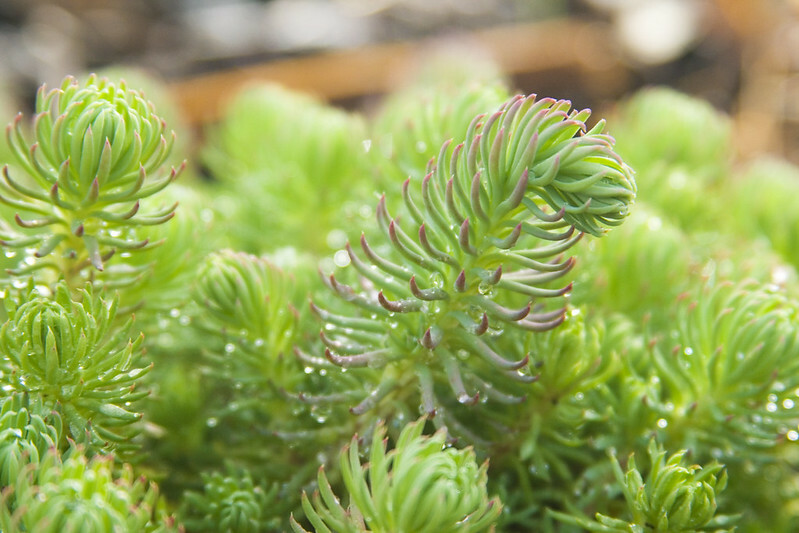 The individual blooms are tiny, but they are borne in such profusion that they smother the plant. 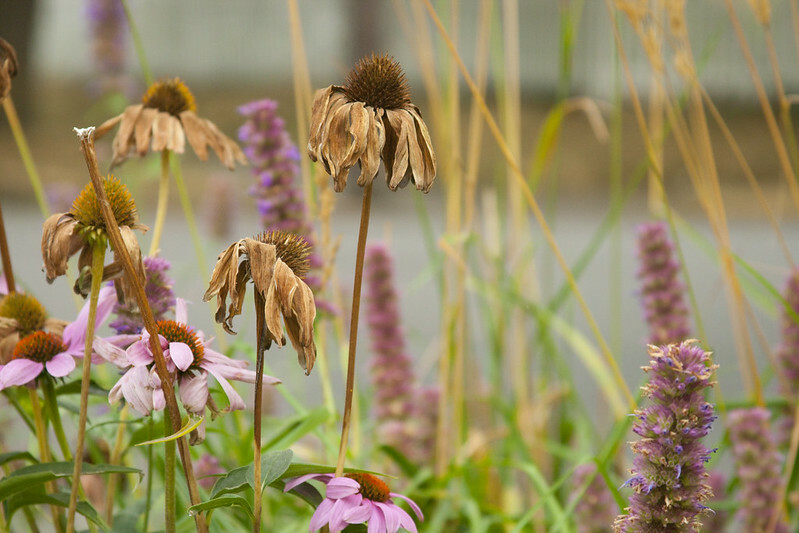 In my youth, I was an avid dead-header, but with most plants, like the Echinacea above, I prefer to leave the seed heads...as long as they are striking...and, luckily, most are. In this last image of autumn (my camera died soon after this pic), I'm struck, looking across the street at the golden lawns and parking strips of my neighbors...quite a contrast to this lush, plant-filled space, huh? 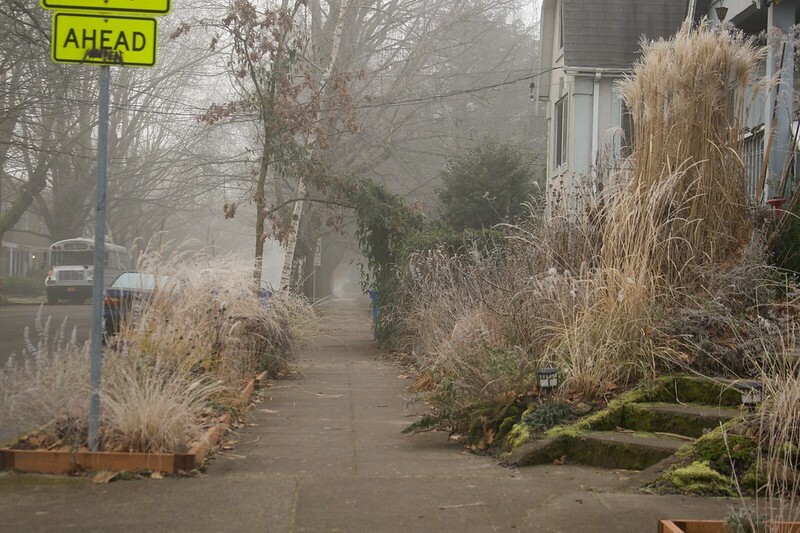 Even in January, the grasses continue to look good, adding valuable structure and movement. 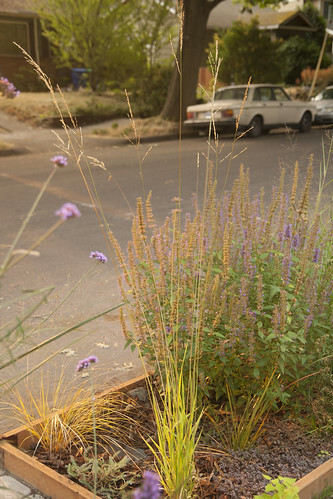 While their southwestern cousins don't have much winter interest, the blue-flowered Agastaches have great winter structure, as seen here, with Agastache 'Golden Jubilee' and Muhlenbergia rigens. While the low winter light is very fetching pouring through grass seedheads, frost is even better. 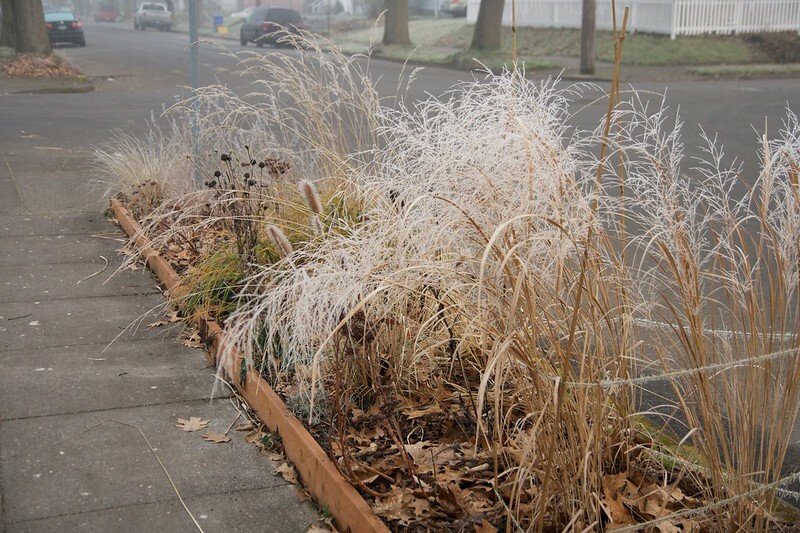 While it's a bit of a rarity here in Portland (especially with our past few non-winters), we were lucky enough to get a few days of glorious frosts, which utterly transforms the garden. And here we are today, with everything cut back and growing like gangbusters. I've already made a few alterations to the layout this spring, and am excited to see how it performs this year. I hope you've enjoyed this little series on the progress of my front parking strip. I have to say, it was challenging, but by no means would I say more difficult than any other part of my garden. 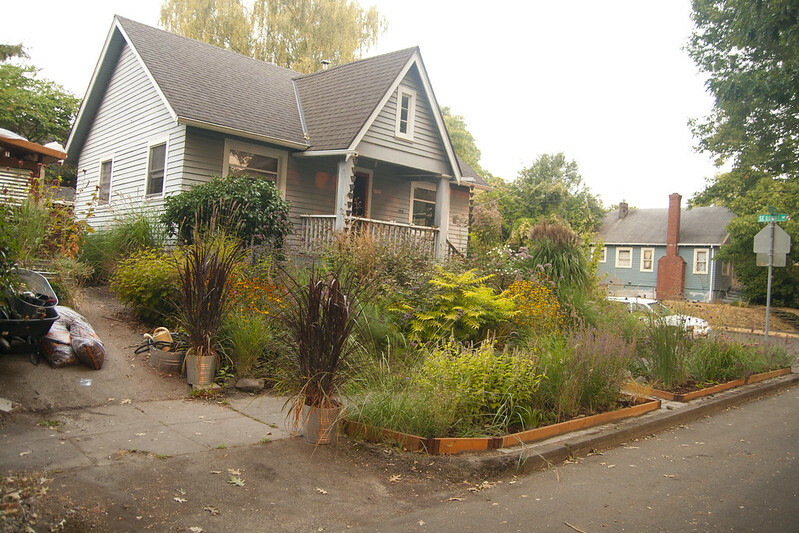 In fact, compared to gardening on my front slope, it's a dream (oh for a large parcel of FLAT land)! I hope everyone out there is having a great spring, so far! Wow for a moment there you actually had me yearing for fall, THAT is saying something. Of course once the spring shot came 'round I was back to my proper mental state. What Loree said. That Vertigo is amazing! 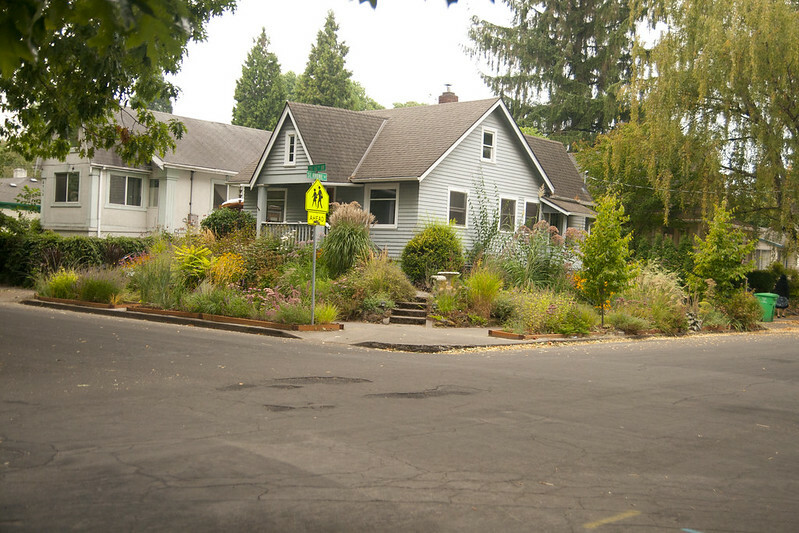 You've done a sterling job with the planting of your parking strip, perfection even, and the year long interest that you managed to achieve is no mean feat. The rich colour palette of autumn is easy to fall in love with, so not surprised that you have a special reverence for this season. 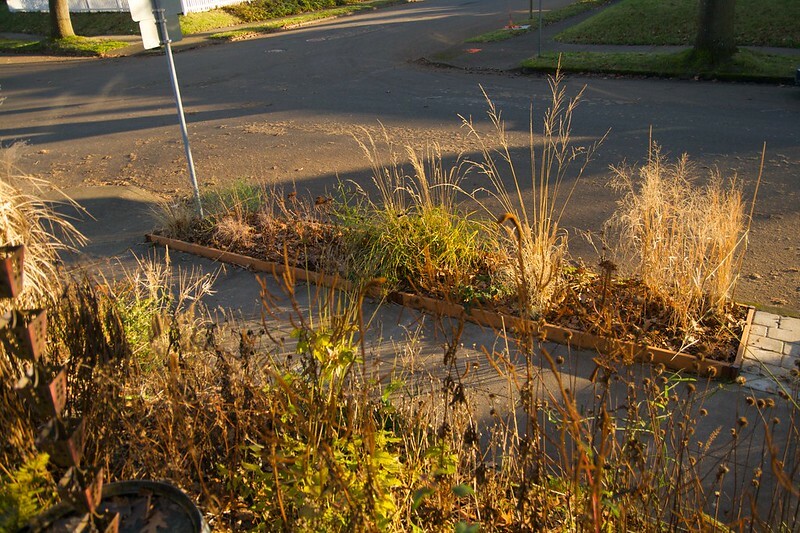 Who knew that something so prosaic as a parking strip could look like a beautiful meadow and catch the autumn light from all directions? What a huge impact this tiny spot makes. I keep wondering how long it will take for the neighbors (at least a few) to start copy-catting your luscious look. I'm liking the Spring look...especially knowing what's to come. I love it. And apparently you don't have deer who enjoy gliding up to your hell strip and eating your treasure down to nubs. (I don't have a hell strip but I do have deer in my front yard.) 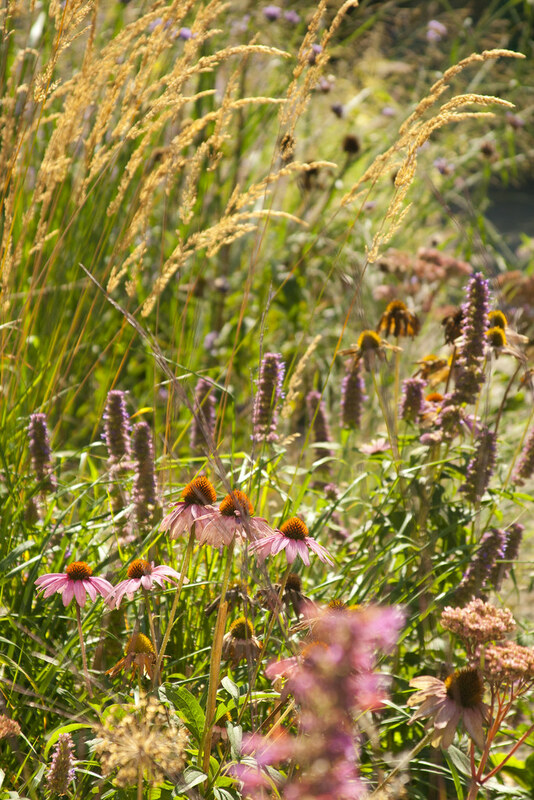 I love the grasses and how they contrast with the forms of the bloomers. What an interesting chronicle. Thanks for sharing. You really did a fantastic job. 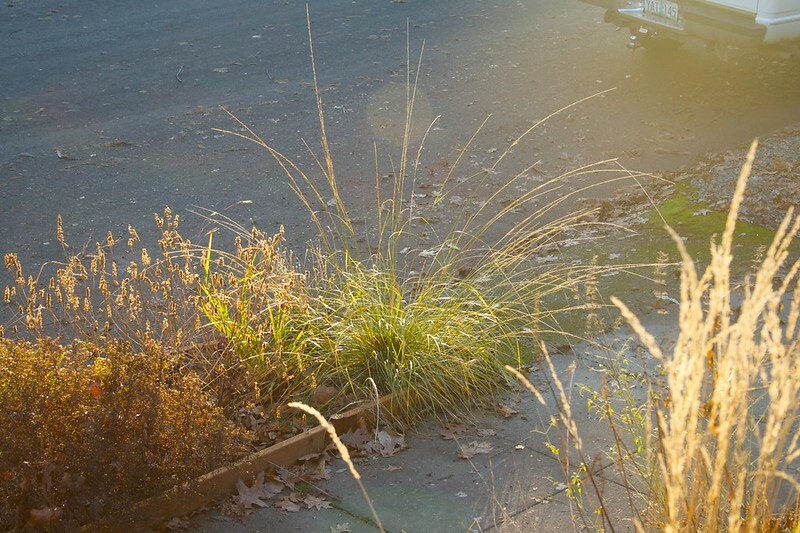 The little bluestem are wonderful. I planted some 'The Blues' last fall. I hope it performs as well as 'Blue Heaven'. Also, I'm interested in 'Prince'. That's S. lateriflorum, right? I used to plant the straight species, but it turns into such a beast, I gave up on it. Does 'Prince' stay more within bounds? 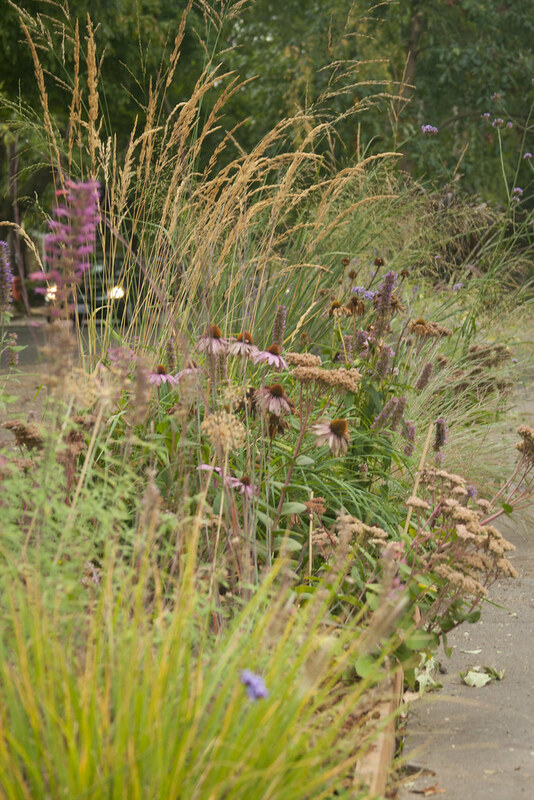 I like the way your parkway planting looks really full without seeming too tall for the location. 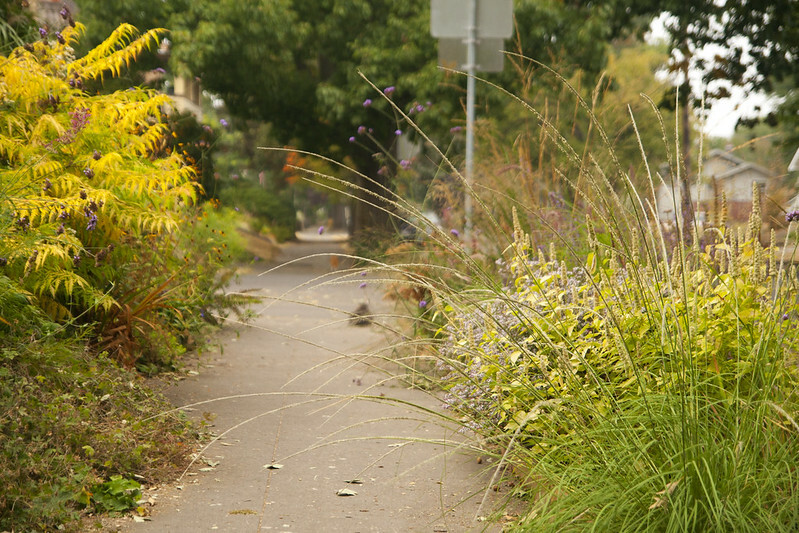 Grasses are usually unwanted in the tropics because they wreck havoc everywhere. But i agree, they look wonderful in photos, and in your garden they are beautiful. 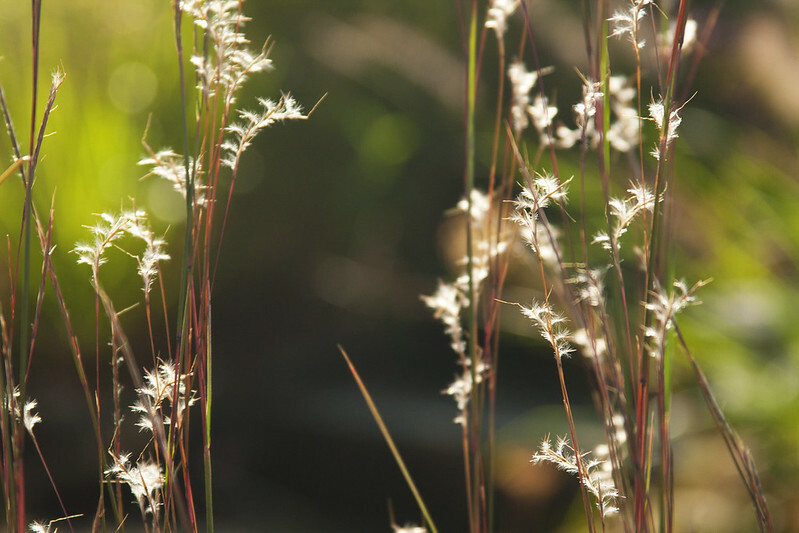 I always remember you as someone who loves grasses and make excellent photos of them. Well done Scott ! Hope there aren't to many fender benders as drivers gawk at your fabulous parking strips ! Things are already very far along for you this Spring. Ours really hasn't done anything serious at all for the Spring. Hoping everything starts growing any day now. Thanks for an incredibly entertaining series. I've always grown 'Vertigo' in the ground but I think this year at least one will go in a pot. Also, you've convinced me that I absolutely must find a spot for Tiger Eye Sumac. Looks great, and I Love seeing how far along things are for you thins spring as well. The 'Blue Heaven' schiz. is a knockout. 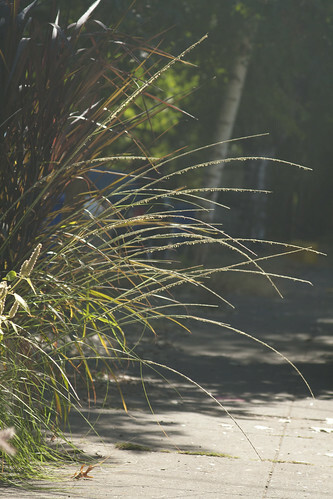 I've seen it and some of the panicums in magazines and, at first, thought they were that terribly invasive Japanese blood grass. Wish I had enough sun to grow Blue Heaven and others. Enjoyed the fall tour! I always love visiting your garden. Have fun with your tweaking! I am doing a lot of that this spring, too, except right now, winter is refusing to leave for the season. It is snowing not too far from here. Our lows for the next several nights are expected to go down to the upper 20s. I am so longing for spring to come to stay! Your garden is so beautiful Scott. You totally have me researching different grasses now as I've realized that's just what my garden is missing! Love, Love, Love your photos, Scott! 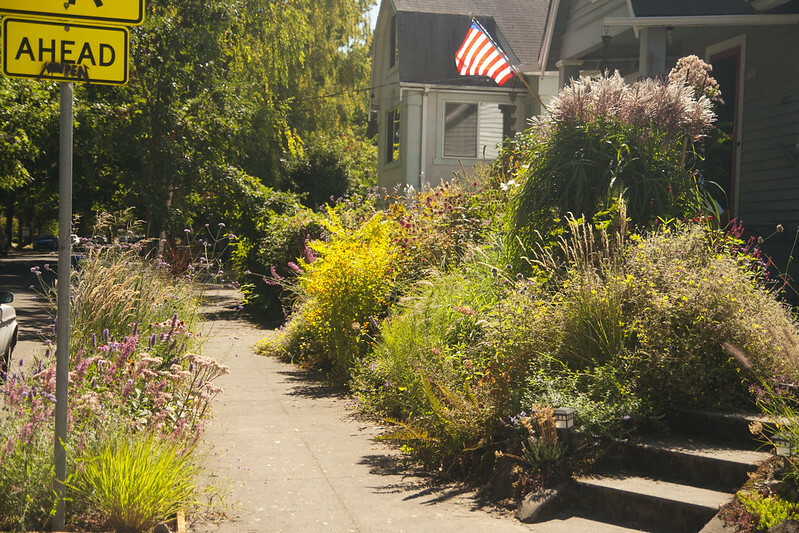 Your gardens are Beautiful! What Paulette Said! Love that Vertigo!